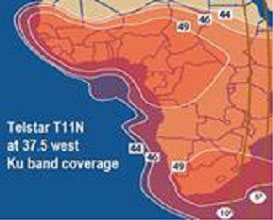 This company provides satellite Internet connection wherever you are in Africa in the satellite beam footprints shown, using 74cm, 98cm, 1m, 1.2m, 1.8m or 2.4m diameter antenna dishes. iDirect Evolution X3 and X5 on the Intelsat IS-14 and Eutelsat E8W. C band (using the lower 4 and 6 GHz frequency bands) is less affected by rain and is ideal for service in very high rainfall locations, but does generally need a larger size satellite dish and much more substantial mounting arrangements. COMTECH EF DATA service is available for SCPC/SCPC using Comtech CDM-570L modems and DVB-S2 / iSCPC using iDirect modems X5. iDirect Evolution X3 DVB-S2 ACM modems on the TELSTAR T-11N satellite. Ku band is ideal for low or moderate rainfall areas and the lower cost, ease of transport and installation of the smaller dish make it attractive. The high power of the Telstar satellite helps to minimise rain affects. Hardware prices* are from Euro 425.00 for a complete system on Ku band. WiFi HotSpot and WLan bridges are available to extend the reach of your VSAT within your business or local community, thus sharing the cost of your VSAT internet connection. iDirect hubs used are at Fuchsstadt /Germany and at Arqiva in the UK and is operated by Intelsat and by Arqiva. Afrikanet are a Virtual network operator so they have control of their own traffic handling arrangements at the hub. Waka Ku band coverage from EUTELSAT E16A satellite. Africa coverage includes Senegal, Ghana, Liberia, Sierra Leone, Cote d'Ivore, Nigeria, Cameroon, Congo, CAR, DRC, Tanzania, Madagascar. Look closely at the map above to see where you are located. Ka-band coverage on High Speed satellite is now available in about 30 countries from Teleport partner in Italy on HughesNet HTS 2xxx modems at a very high speed. ► Page created 3rd June 2006, updated significantly 13 March 2017, HTML5 19 Jan 2019. I have written and updated this page using some information provided by AfrikaNet and used here with their kind permission. This is not a paid-for advertisement.